In recent years, the Andorran financial market has witnessed a major transformation in its banking sector. Different factors, both domestic and international, have posed challenges that require an efficient and professional response with a clear agenda. Andorra remains a solid and attractive financial market in this new context, and MoraBanc has become the standard of how a bank can implement change while continuing to provide high-quality services to clients. Throughout this transformative process, MoraBanc has remained a competitive company with an upward performance trajectory. In 2014, Andorra signed a declaration of automatic exchange of information in tax matters with the Organisation for Economic Cooperation and Development. This step towards transparency, along with adopting new international financial standards, was a challenge for the country’s banks. Nevertheless, through hard work and determination, by the end of 2017, MoraBanc had efficiently and effectively adapted to the new banking landscape; achieving the goals set out in a successfully implemented strategic plan. Based on three broad courses of action, the transformation of MoraBanc’s banking model ensures that the company is now ready and willing to take on the challenges of the future. MoraBanc’s efforts to adapt for the future have culminated in a number of significant achievements. Receiving the Best Digital Bank, Andorra and Best Mobile Banking App, Andorra awards from World Finance was recognition of the success of the long-term project at the centre of MoraBanc’s transformation. Striving for innovation and becoming a leading digital bank were two of the strategic planís key objectives, and these awards demonstrate what a success the development has been. The new MoraBanc Digital platform was launched in December 2016 after more than two years of preparation, and now offers a more modern website that provides significantly more information to clients. The digital banking offering is responsive and adapts to a large number of different platforms. It includes a new online banking website that is more operational, intuitive, modern and user-friendly than what was previously available. Additionally, a mobile application was developed to respond to clientsí immediate and day-to-day banking needs. After a strong initial launch, the platform continues to evolve, with new features and improvements to be added over the coming months. The presentation of MoraBanc Digital was coupled with a strong communication campaign, designed in three stages and with a digital focus in order to help clients successfully incorporate the new platform into their daily lives. Employees were included first, with press interest and advertising then helping the tool gain credibility. The bankís branded content then went viral in what proved to be a crucial step towards increasing client commitment and participation. Through Facebook and Instagram, MoraBanc’s branded content reached 268,000 people, while videos released by the bank have since generated 105,000 views. All this was achieved in just five months. These figures are a remarkable result, considering the population of Andorra is only 78,700. Thanks to the success of this campaign, MoraBanc Digital has more than tripled its number of new digital clients. Visits to MoraBanc’s website have increased 84 percent, and money transfers through the digital service have grown by 33 percent. All of this points towards the success of the digital platform, with people enthusiastic to use the new service. While undertaking a digital transformation is a challenge on its own, doing so while maintaining the identity and culture of a bank is far more difficult. MoraBanc is a family bank that has managed to maintain its values, including sound judgement and a commitment to being a trustworthy bank with high levels of solvency, over the entirety of its 65-year history. These values, now combined with a modern and innovative spirit, remain the cornerstone of MoraBanc’s operations even after the digital transformation process. Such values were all included in the strategic plan and played a key role in ensuring the next chapter of the MoraBanc story will be a success. A clear vision for the future of any business or organisation comes from the top. In line with best international practices, the bankís governing bodies have been bolstered in recent months by the addition of independent directors to the board. The management chart has been redefined and the teams have been restructured with a clear purpose: to increase efficiency and competitiveness. Another factor central to an updated MoraBanc is the need to reinforce its balance sheet. This will allow it to become an even stronger and more robust institution in these challenging times. The bank’s solvency increased by 390 basis points this past year, placing it at 19.04 percent, according to the Basel CET1 standards. MoraBanc continues to be the most solvent bank in the domestic market, and it has adapted to the Basel III international standards of transparency and disclosure. In terms of market positioning, dual efforts have been made to increase MoraBancís domestic market share in Andorra and promote its growth on an international scale. In Andorra, MoraBanc has based its strategy on a simple but effective credit campaign. ‘We grant loans’ is the motto of the advertising campaign that the bank created in order to position itself as the Andorran bank most likely to approve loans for individuals and companies. At a time when not all banks were willing to extend their line of credit, MoraBanc’s strong balance sheet allowed it to provide solutions to individuals and businesses, while also increasing its market share. Over the past year, the bank has rolled out a range of products, including car loans, electric vehicle loans, fixed mortgages, vacation loans and trade loans. It managed to move in a very static market, differentiating itself from its competitors, and has seen a notable increase in loan contracting in the past six months compared with the same period of the previous year. Mortgages increased by 41 percent, while car loans grew by 70 percent. Without closing the door to other target markets, MoraBanc is working together with its international wealth management subsidiaries in Switzerland and Miami to become a benchmark among Spanish-speaking clients. It has so far achieved success that has surpassed its objectives, as the subsidiaries registered growth in client assets of 43.6 percent in 2016. These actions have been carried out with positive results both domestically and internationally. 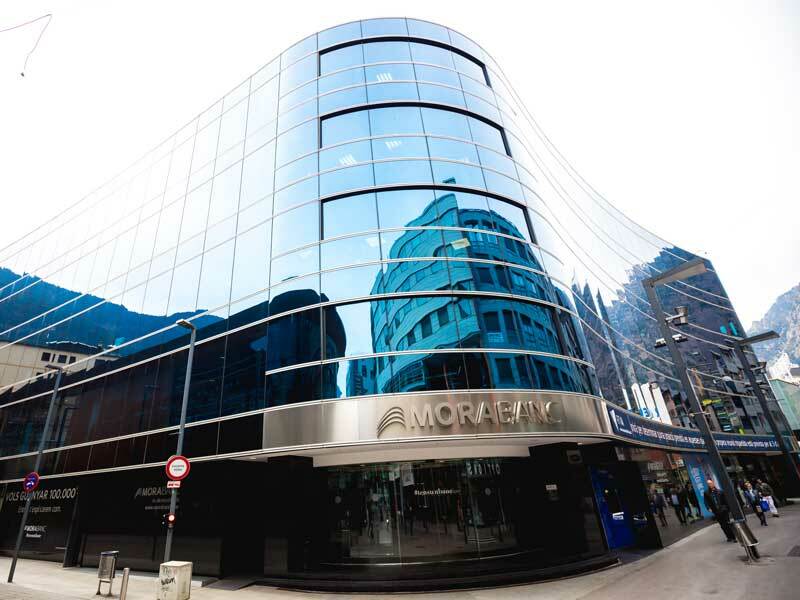 Together with the family values and the spirit of modernity and innovation that transformed the organisation, MoraBanc has firmly entered a new era of banking in Andorra with results that have exceeded expectations. MoraBanc’s strategy, often quite novel when compared with its competitors, has strengthened the public’s perception that the institution is a different kind of bank. Its commitment to adopting all international regulations and requirements in the shortest possible time has ensured that the bank can focus on future plans, while following the new rules of the industry. While presenting a proposition that is unique to Andorra, MoraBanc’s transformation is not an isolated case in the context of the country’s broader development. Andorra and its government have shown a firm commitment to adopting international rules and regulations by introducing a tax scheme and a legal framework that inspire confidence from investors, businesses and private individuals. Andorra has become a very attractive destination as far as setting up a business or home is concerned. As a central location, just two hours away from Barcelona and Toulouse, the principality offers a good quality of life, a high level of public security and attractive tax rates. These reasons and more are enticing an increasing number of businesses and expats to the country. This is all a growth factor for both Andorra and MoraBanc. The company strives to deliver a good service to these groups through a department made up of highly specialised international experts who are more than capable of meeting the needs of individuals. MoraBanc also participates in unique projects beyond the banking sector, like Casa Vicens in Barcelona, the first home built by renowned architect Antoni Gaudí. Constructed between 1883 and 1885, the building represents a complete transformation of what was a private residence. The bank purchased it in 2014, and this year opened the doors of Casa Vicens as a house and museum. The bank is also an investor in the Formula E electric car racing championship, demonstrating a commitment to yet another unique project that combines the quest for profitability with innovative sustainability. In Andorra, MoraBanc sponsors the country’s basketball team in the Liga Endesa, Spainís top-tier competition and the second-largest national league in the world. The MoraBanc Andorra games are by far the biggest and most popular social event in Andorra, and play an important role in social cohesion. In addition, the bank’s corporate social responsibility programme includes a series of cultural events, environmental actions, humanitarian projects and initiatives that continue to grow the bankís presence in Andorra, while also reaching beyond the borders of the small principality. All of these contributions and the successful outcome of a profound strategic transformation ensure that MoraBanc can face the future with soundness and confidence while identifying further opportunities for growth. The bankís success story is a perfect example of how to adapt to change, and an excellent illustration of the new revolution in Andorran banking.